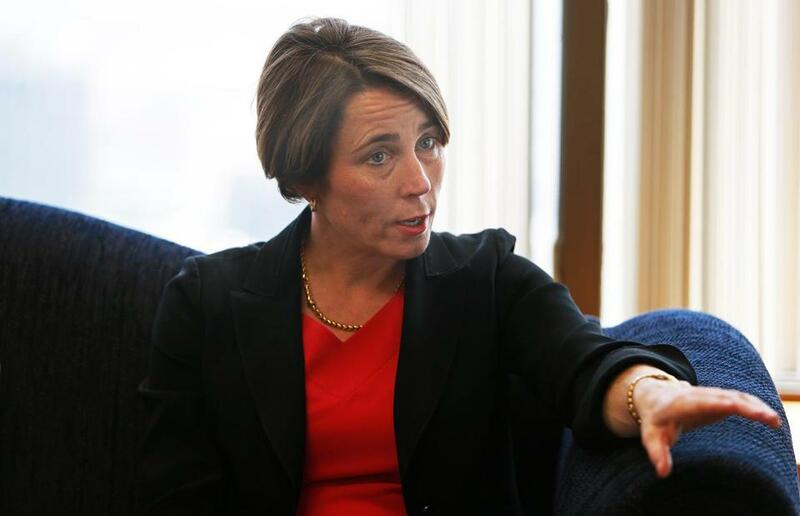 Attorney General Maura Healey is asking an administrative law judge to order the state’s largest utilities to refund up to $180 million and cut electricity bills by $74 million a year. Healey, at a series of hearings beginning in Washington Thursday, will argue that federal regulators allowed Eversource Energy, National Grid, and their investors to earn too much in profits from power transmission lines. If Healey is successful, the average Massachusetts household would receive one-time saving about $70 on its electric bill, plus annual reductions of $29 — about $2.40 a month. Transmission charges, the fees for operating high-voltage lines, account for 10 to 15 percent of an electric bill. The costs of electricity and distributing it to homes and businesses account for the most of the bill. The hearings are the latest confrontation in a long-running dispute between utilities and the Massachusetts attorney general, who acts as the advocate for utility customers, over the financial return the companies earn from transmission. Regulated utilities must get approval to undertake big, expensive projects like installing transmission lines because customers ultimately pay the cost of such improvements. If regulators decide the projects are necessary, they typically allow utilities to raise rates to recover the costs, plus a reasonable rate of return, or profit. Healey, supported by business and consumer groups, says the 11.1 percent rate of return allowed by the Federal Energy Regulatory Commission should be cut to between 8 and 9 percent. They argue, among other things, that current returns are too high given utilities’ low borrowing costs in recent years as interest rates have hovered near historic lows. “It has become much cheaper to get capital, and their rates of return should reflect reality,” said Charlie Harak, an attorney with the National Consumer Law Center, an advocacy group in Boston. But utility companies say their earnings on transmission projects are reasonable and vital for making further improvements to meet the demands of electric customers. In addition, they say, meeting green energy and other goals set by state and federal governments will require new transmission lines to transport power from remote areas where many alternative energy developments, such as wind farms, are located. “The ability to raise the significant capital necessary to construct new transmission is dependent on providing appropriate returns to investors,” said Michael Durand, spokesman for Eversource Energy, which owns more than half of the electrical transmission in the New England. The average rate of return for 20 utility companies analyzed by an specialist working for Healey was 10.3 percent, lower than the rate for New England utilities. The cases being tried this week involve a period beginning in December 2012 and running through the present. The hearings are expected to last four to five days. A decision is expected in mid-2016. This represents the third challenge to rates of return that the attorney general’s office has filed since 2011. One case, regarding the rate of return between October 2011 and December 2012, was decided in 2013 when an administrative law judge reduced the return on equity to 9.7 percent from 11.1 percent. In 2014, the energy commission raised that rate to 10.6 percent. Both sides have appealed, and about $30 million in refunds are pending.